Zane Specter Litt Wheeler Williams. That’s quite a mouthful now. I was quite disappointed when Suits chickened out in its mid-season finale and took the easy way out by naming both new entrants Alex Williams and Samantha Wheeler named partners. That disappointment continues in the premiere episode of Suits Season 8 as we now have a firm named so large it’s far off from the Pearson-Hardman days of Season 2. At this rate, it’s going to take 4-5 lines just to spell out the lawfirm’s title. 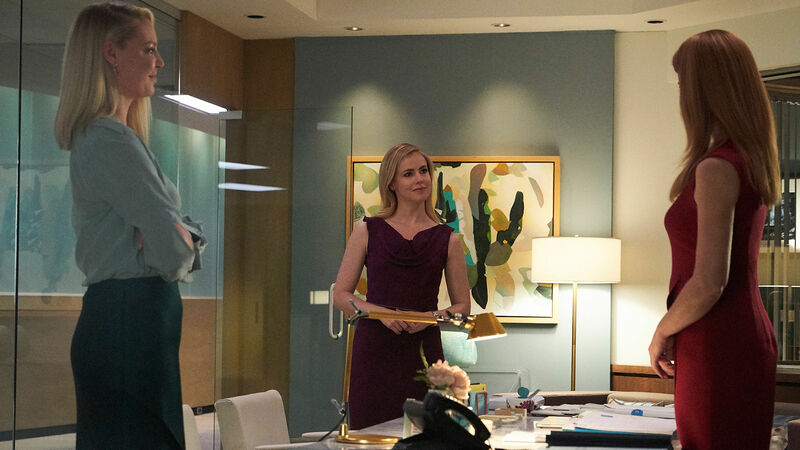 For the most part, Suits delivers a pretty standard episode, staying safe to its formula while offering some character development as a respite. The key struggle this episode is everyone adjusting and coming to terms with Louis’ new role as managing partner. Naturally, this gives Louis a lot of material to play around with and Rick Hoffman takes full advantage, displaying a wide range of personalities from being cool, funny and stern to even mimicking and quoting Churchill in Gary Oldman style. Hoffman has a lot of fun with his new elevated position, which should also come as relief for fans used to seeing him battered and ridiculed quite often. In an attempt to avoid coming in the way of their new boss, Harvey and Robert take up a boxing match-fixing case against their fellow nemesis Andrew Malik. Part of the motivation behind taking the case is personal; Malik’s going after Jessica and the duo seek to malign and tarnish his reputation. The ins and outs of the case don’t matter because if you’ve been following Suits all this while now, you’ll know Harvey and Zane will come out of this victorious. It does give the writers some room to throw a lot of Rocky references, even titling the show as one of the upcoming installments in the long running Rocky franchise. What’s interesting however, is Harvey’s connection to boxing which makes this case somewhat personal for him in yet another way. Gabriel Macht conveys his affinity for boxing nicely although I did feel more could’ve been done with the boxing angle. There’s a short snippet where he expresses his frustration at the boxer for having succumbed to match-fixing. His motivations are understandable (and probably inspired by real-life events too I’m sure); the boxing has made his head pretty unstable and he’s unsure how long he can have a career, thus wanting an easy way out while providing for his family. Harvey of course refuses to empathize while lashing out at him for ruining the sanctity of the sport. You can see in that moment that Harvey would’ve definitely been a boxer if not a lawyer and Macht sells that perfectly. This highlights a key difference between Zane and Harvey. Zane is a family man, with his daughter Rachel being a prominent part of the show’s first six seasons, until Meghan Markle’s departure in lieu of her marriage to Prince Harry. Zane is therefore able to empathize with the boxer’s dilemma for wanting to provide for his family, as opposed to Harvey for whom the closest family has been his brother and estranged mother, both of which he’s not on regular talking terms with. I hope this conflict plays out in the fall run’s remaining episodes. The women have their own issues to deal with. After Alex put Katrina in a tough spot (who by the way, is also promoted), Samantha threatens her to fix the mess. With some advice from Donna, Katrina is able to fight her way out of the situation and emerges as a smart lower. As she acknowledges owing a favor to Samantha, she also makes sure to get one in return. Probably the strongest power-plays by her and a good enoug indicator that we have more to see of Amanda Schull in this show’s newfound arc. And did I mention Donna might have a new love interest? She hits it off with one of their clients Thomas who looks like he could be a major player in the series going forward. Of course Harvey-Donna fans would be disappointed but from the looks of it, this’ll probably be Donna’s last fling before she and Harvey realize their affections for each other which, let’s face it, is not only inevitable but long overdue now. The somewhat disappointing thing about Suits is that it seems to have settled into a groove now. It has a standard template where it presents some challenging situations in the opening moments, keeps the cast busy throughout the episode, and then wraps things up neatly by the episode’s end. Everyone’s happy, sorry, relieved or thankful, amends are quickly made, no grudges are harbored, and everybody walks home peacefully. Save for a few instances where a conflict carries over as an arc throughout the season (like the Alex-Samantha conflict in Season 8’s first 10 episodes), these standalones offer nothing much in terms of narrative, but are a fun watch regardless just to see the corporate issues they deal with.